If you’ve ever made one of those long, cross-country road trips, you know how your back feels by the time you finally reach your destination. It can be days before your back stops aching. The simple answer to that back pain is to use a lumbar support car system. 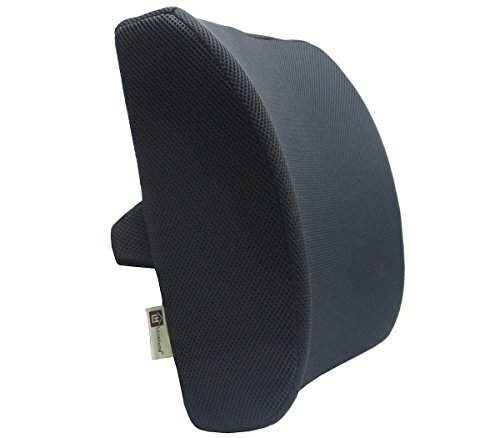 Many people are completely unaware of the existence of a lumbar support pillow for car seats. They are easy to find, easy to use, and really make a difference in how your back feels after a trip in your car. The whole purpose of a lumbar support system is to improve your sitting posture while traveling. Slouching and other poor posture habits can be easily corrected, making travel comfortable and safe. 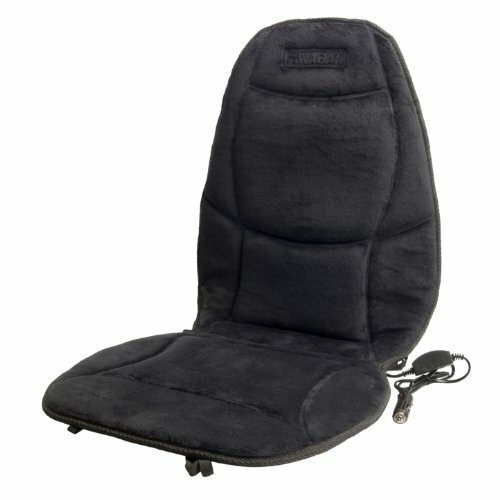 Here are a few things you should consider before you go shopping to find the best lumbar support car seats available. What your lumbar support system is filled with makes a significant difference in your comfort level. There are different types of foam and other materials used to provide the support for your back. Lesser quality lumbar support systems use inferior materials which break down quickly. Higher quality products include filling materials that form exactly to the shape and contour of your back. Some of the earlier designs were not much more than a rolled up piece of foam rubber. While that may work in some situations, they are really not the best lumbar support pillow car pillows. Ones that are ergonomic and adjust easily to the shape of your back are ideal. There’s nothing worse than having a seat cushion or lumbar support pillow that won’t stay in place. Finding a model that ensures your support system will remain firmly in position on your seat is very important. If your lumbar support slides downward or off to one side, it can become very uncomfortable. In fact, your back may hurt worse if you can’t keep the cushion in place. Not all car seats and car users are the same. If you share your vehicle with other drivers, it’s best to have a lumbar support that is easy to adjust. If you use different cars, such as rentals or company fleet vehicles, you need to know that your lumbar support will work comfortably in each one. That brings up the subject of transporting your cushion between vehicles. If you will be in a situation where you regularly transfer between vehicles, make certain that the design you select is lightweight and easy to carry. Which one is the best? There are hundreds of different manufacturers and models available on the market today. We’ve done most of the research for you, so all you have to do is pick the one you like the best. Of course, our experts have already selected the one they think is superior. Let’s see if you come to the same conclusion. This high-quality memory foam lumbar support cushion is designed to improve your posture, relieves back stress, and reduce pain in the lower back. It supporters the area from the base of the spine to midway up the back. The mesh fabric cover keeps your back from resting against the seat so that you never have a problem with perspiration. The LoveHome lumbar support system is adjustable so that you can position it anywhere on the back of your seat. This model is washable and made from a memory foam product that resists odors and staining. For some car models, the support strap doesn’t snug up tightly around the seat, allowing it to slip and sag. This lumbar support pillow from Everlasting Comfort has an orthopedic design to its cushion. The natural curve shape fits comfortably with any style of chair or size and weight of user. The memory foam is very high quality and doesn’t ‘squish’ or sag. Unlike those models with a single strap, the two strap system allows this cushion to be firmly attached to any seat back. While the cover comes off for easy washing, the real positive note about this model of lumbar back support is its dual-strap design. Although the cushion is very comfortable and conforms to the shape of your back, it is also rather thick. This causes the user to sit forward substantially. 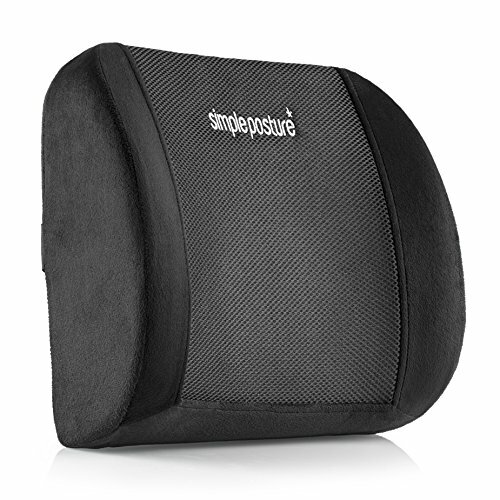 The support provided by the Simple Posture lumbar pillow will quickly reduce lower back pain. The way it fits to the natural contour of the back provides support needed for excellent posture. This cushion comes with a full 90-day money back guarantee so you can try it without concern of having any issues with the product. The memory foam used in this lumbar support cushion molds easily to anyone’s back, providing support where it’s needed the most. Its small size makes it easy to transport between vehicles or home and car. The sides of this cushion are very firm, causing the back to push in between them. This high quality lumbar support system provides extended comfort, allowing hours of pain-free driving. Its ergonomic shape helps to straighten and align your back. Ziraki has gone out of their way to create a well-designed lumbar support that is enjoyed by thousands of users. Zikari gives you the option of two different covers for your lumbar support pillow—both are included with your purchase. The Ziraki 5 in 1 Lumbar Support includes a special gel insert that is designed to keep your back cool. These specially designed cooling pads will give you hours of comfort. Although the manufacturer describes the cushion as filled with a memory-foam material, many users have stated that it is too rigid. This fascinating cushion from ObusForme provides a level of comfort not found in other lumbar support systems. What’s unique about the CustomAIR is the ability of the user to customize the lumbar support through use of an air pump. This inflatable lumbar support for car seats allows the user to make easy adjustments to the cushion for maximum comfort. The accompanying pump stores easily when not in use. The design permits the back to align properly for perfect posture. It also helps to reduce muscle strain so that the user experiences less fatigue and back pain. This model comes equipped with an elastic strap that allows you to fit the cushion to almost any car seat. It can also be fitted to office chairs, recreational vehicles, or other situations where lumbar support may be needed. 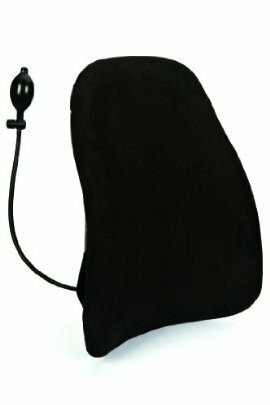 While most users seem satisfied with the inflation bladder in the lumbar support, others have complained that it inflates unevenly. This back support from EVA Medical has several added features that you won’t find on other lumbar support cushions. This product has an ergonomic design which includes foam inserts which allow you to change the shape of the lumbar pillow. This allows the user to customize the support cushion to meet specific needs. In addition to the foam inserts, EVA Medical provides two different types of gel inserts – one for cooling your back as you drive, and the other to provide warmth. This cusion’s customizable foam and gel inserts make it very popular with customers. Back specialists like how it properly situates the spine, keeping it properly aligned and allowing the pelvis to have a healthy forward tilt. The EVA Medical lumbar support is made from very high quality foam that won’t break down and collapse. Its flexible design allows it to be used in all types of vehicles, as well as office chairs, upholstered chair, and even in standard-sized wheelchairs. The EVA Medical pillow comes with a single strap with which to attach it to the car seat. The design doesn’t seem to keep the cushion in place. The engineers at Wagan have created the ultimate in a lumbar support cushion. Not only does it provide comfort to the back, it also offers a heating system that warms and soothes the entire back. 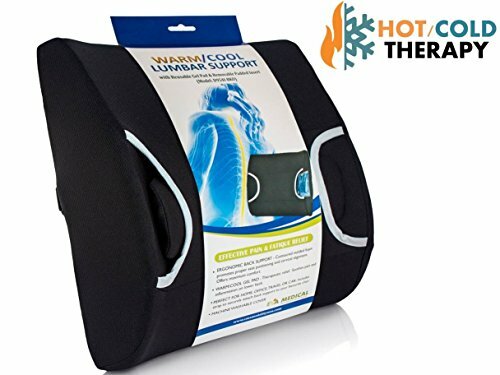 This is one of the few heated lumbar supports for car seats available in todays crowded market. Unlike most of the pillow-style models available on the market today, the Wagan product covers the full back and bottom of the seat. The heating system is adjustable to 114 degrees (F) and warms the entire seat area. It comes with a 12 volt adapter and works with any standard car power outlet. This heated Seat Cushion provides comfort to the entire back. The lumbar support is designed to give just enough padding to the lower back. It includes four straps to help keep it in place on the seat. The heating element pulls a lot of current, and some customers have found it won’t work well with their 12 volt outlets. 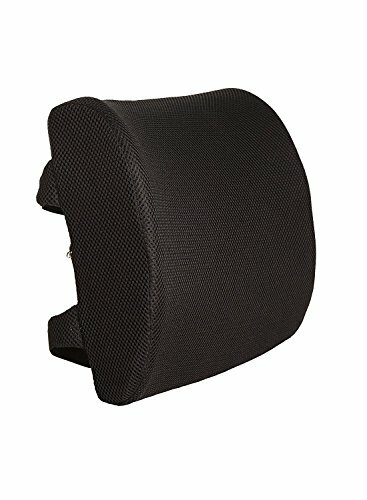 Which Lumbar Support Is Best? Each of these products are made from quality materials and provide added comfort for any driver. However, the award for the best lumbar support for car seats goes to the design by ObusForme. The inflatable pillow provides just the right amount of support for users, and can be easily adjusted for different drivers. This unit is portable, adjusts easily to the car seat, and is made of the highest quality materials. You certainly won’t be disappointed with the Ergonomic CustomAIR by ObusForme.